Ramadan Abdullah Shallah is the former secretary-general of Palestinian Islamic Jihad (PIJ) who led the group from 1995 until 2018. Under Shallah’s leadership, PIJ launched thousands of rockets at Israel from Gaza and carried out dozens of suicide bombings.“Country Reports on Terrorism 2013,” U.S. Department of State, April 30, 2014, http://www.state.gov/j/ct/rls/crt/2013/224829.htm; Efraim Benmelech and Claude Berrebbi, “Human Capital and the Productivity of Suicide Bombers,” Journal of Economic Perspectives 21, no. 3 (Summer 2007): 223–38. He maintained he would never recognize Israel and that there is no hope for a two-state solution.Scott Atran and Robert Axelrod, “Interview with Ramadan Shallah, Secretary General, Palestinian Islamic Jihad,” Perspectives on Terrorism, November 29, 2010, http://www.terrorismanalysts.com/pt/index.php/pot/article/view/95. In October 2018, PIJ elected Ziad al-Nakhalah as its new secretary-general, six months after Shallah reportedly fell into a coma following surgery.“Iran-backed Palestinian Islamic Jihad names new leader,” Associated Press, September 28, 2018, https://apnews.com/d14e7e6a4a68481980b6db8052853f03; “Palestine’s Islamic Jihad denies leader was in coma in Lebanon,” Middle East Monitor, April 10, 2018, https://www.middleeastmonitor.com/20180410-palestines-islamic-jihad-denies-leader-was-in-coma-in-lebanon/; “Palestinian Islamic Jihad chooses new leader, remains close to Iran,” Times of Israel, September 28, 2018, https://www.timesofisrael.com/palestinian-islamic-jihad-chooses-new-leader-remains-close-to-iran/. In the early 1990s, Shallah taught at the University of South Florida (USF). He returned to Gaza in 1995. Susan Aschoff, “Jihad Leader Emerged from Shadows of USF,” St. Petersburg Times, February 21, 2003, http://www.sptimes.com/2003/02/21/TampaBay/Jihad_leader_emerged_.shtml. He became PIJ’s secretary-general later that year after the death of his predecessor, Fathi Shaqaqi, in Malta. Susan Aschoff, “Jihad Leader Emerged from Shadows of USF,” St. Petersburg Times, February 21, 2003, http://www.sptimes.com/2003/02/21/TampaBay/Jihad_leader_emerged_.shtml. In 2003, a U.S. federal grand jury accused Shallah of providing material support to PIJ, conspiracy to kill and maim persons abroad, racketeering, immigration fraud, perjury, extortion, and obstruction of justice. “Members of the Palestinian Islamic Jihad Arrested, Charged With Racketeering and Conspiracy to Provide Support to Terrorists,” U.S. Department of Justice, February 20, 2003, http://www.justice.gov/opa/pr/2003/February/03_crm_099.htm. Iran provides PIJ with material support including weaponry and funding. “Country Reports on Terrorism 2013,” U.S. Department of State, April 30, 2014, http://www.state.gov/j/ct/rls/crt/2013/224829.htm. Reports surfaced in July 2012 that Shallah and the PIJ leadership had moved to Iran amidst the ongoing Syrian civil war. 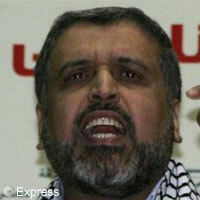 “Islamic Jihad Leadership Relocates to Iran,” Asharq Al-Awsat, July 22, 2012, http://www.aawsat.net/2012/07/article55241265. PIJ denied its leadership had left Syria, “Islamic Jihad Leadership Relocates to Iran,” Asharq Al-Awsat, July 22, 2012, http://www.aawsat.net/2012/07/article55241265. though Shallah regularly praised PIJ’s relationship with Iran Lena Odgaard, “Head of Palestinian Islamic Jihad Praises Relationship with Iran,” Al-Monitor, November 30, 2012, http://www.al-monitor.com/pulse/originals/2012/al-monitor/shallah-interview.html. and met with Iranian officials. Asmaa al-Ghoul, “Hamas Isolated as Iran Boosts Ties with Islamic Jihad, Fatah,” Al-Monitor, February 12, 2014, http://www.al-monitor.com/pulseen/originals/2014/02/islamic-jihad-fatah-hamas-iran-palestinians.html. In April 2018, Shallah reportedly fell into a coma after being hospitalized in Lebanon for heart surgery. PIJ denied the reports of Shallah’s illness.Palestine’s Islamic Jihad denies leader was in coma in Lebanon,” Middle East Monitor, April 10, 2018, https://www.middleeastmonitor.com/20180410-palestines-islamic-jihad-denies-leader-was-in-coma-in-lebanon/. Nonetheless, PIJ elected Ziad al-Nakhalah to replace Shallah that October.“Iran-backed Palestinian Islamic Jihad names new leader,” Associated Press, September 28, 2018, https://apnews.com/d14e7e6a4a68481980b6db8052853f03; “Palestine’s Islamic Jihad denies leader was in coma in Lebanon,” Middle East Monitor, April 10, 2018, https://www.middleeastmonitor.com/20180410-palestines-islamic-jihad-denies-leader-was-in-coma-in-lebanon/; “Palestinian Islamic Jihad chooses new leader, remains close to Iran,” Times of Israel, September 28, 2018, https://www.timesofisrael.com/palestinian-islamic-jihad-chooses-new-leader-remains-close-to-iran/. Ramadan Abdullah “Most Wanted Terrorists: Ramadan Abdullah Mohammad Shallah,” Federal Bureau of Investigation, accessed November 11, 2014, http://www.fbi.gov/wanted/wanted_terrorists/ramadan-abdullah-mohammad-shallah. The Department of the Treasury designated Shallah a Specially Designated Terrorist pursuant to Executive Order 12947 on November 2, 1995.“Specially Designated Nationals,” U.S. Department of the Treasury, November 2, 1995, http://www.treasury.gov/resource-center/sanctions/SDN-List/Documents/sdnew95.txt. On February 20, 2003, the Department of Justice charged Shallah and other suspected PIJ members with operating a racketeering enterprise from 1984 to present (2003) that engaged in violent activities, conspiracy within the U.S. to kill and main persons abroad, conspiracy to provide material support and resources to PIJ, conspiracy to violate emergency economic sanctions, engaging in various acts of interstate extortion, perjury, obstruction of justice, and immigration fraud.“Members of the Palestinian Islamic Jihad Arrested, Charged With Racketeering and Conspiracy to Provide Support to Terrorists,” U.S. Department of Justice, February 20, 2003, http://www.justice.gov/opa/pr/2003/February/03_crm_099.htm. On February 24, 2006, the FBI listed Shallah as one of its most wanted terrorists and offered a reward of up to $5 million for information leading to his capture or conviction.“Most Wanted Terrorists: Ramadan Abdullah Mohammad Shallah,” FBI, accessed November 11, 2014, http://www.fbi.gov/wanted/wanted_terrorists/ramadan-abdullah-mohammad-shallah. Ramadan Abdullah Shallah is the former secretary-general of Palestinian Islamic Jihad (PIJ) who led the group from 1995 until 2018. “In the past two decades, Iran has had an outstanding stance on Palestine, Israel and the resistance.” Ibrahim Humeidi, “Islamic Jihad Leader Discusses Iran, Reconcilitation,” Al-Monitor, May 22, 2014, http://www.al-monitor.com/pulseen/politics/2014/05/palestine-syria-iran-islamic-jihad-interview-reconciliation.html. “This is what Israel and its allies want, for all of its enemies from all parties in Syria and the region to fight [each other]. What could be better [for them]?” Ibrahim Humeidi, “Islamic Jihad Leader Discusses Iran, Reconcilitation,” Al-Monitor, May 22, 2014, http://www.al-monitor.com/pulseen/politics/2014/05/palestine-syria-iran-islamic-jihad-interview-reconciliation.html. “Our resistance will continue as far as there is Israel, as far as there is occupation, the daily aggression against our people. Let me make it clear: Our arms are only for Palestine. Our arms aren’t for rent. We will continue until we see the Dome of the Rock, Jaffa and Haifa.” Ali Hashem, “Islamic Jihad Leader: Negotiations Gain ‘Nothing,’” Al-Monitor, March 14, 2014, http://www.al-monitor.com/pulseen/originals/2014/03/islamic-jihad-pa-israel-ramadan-abdullah-shalah.html. “Our performance from one war to another is getting better. If in 2012 we hit Tel Aviv, I think the enemy can imagine what can be beyond Tel Aviv.” Ali Hashem, “Islamic Jihad Leader: Negotiations Gain ‘Nothing,’” Al-Monitor, March 14, 2014, http://www.al-monitor.com/pulseen/originals/2014/03/islamic-jihad-pa-israel-ramadan-abdullah-shalah.html. “Unfortunately, the Palestinian Authority [PA], in response, is banning the resistance, though there's great potential, and our people are ready to rise up once again. Why are they committed to security coordination with Israel? What does security coordination mean? It means that the PA is working for Israel.” Ali Hashem, “Islamic Jihad Leader: Negotiations Gain ‘Nothing,’” Al-Monitor, March 14, 2014, http://www.al-monitor.com/pulseen/originals/2014/03/islamic-jihad-pa-israel-ramadan-abdullah-shalah.html. “…those who chose the negotiation path gained nothing. We all lost because of them.” Ali Hashem, “Islamic Jihad Leader: Negotiations Gain ‘Nothing,’” Al-Monitor, March 14, 2014, http://www.al-monitor.com/pulseen/originals/2014/03/islamic-jihad-pa-israel-ramadan-abdullah-shalah.html. “Do we accept the 1967 borders? No. We have to restore all of Palestine.” “Meshaal: Palestinian State Will Be the Fruit of Liberation,” Middle East Monitor, November 28, 2012, https://www.middleeastmonitor.com/news/middle-east/4736-meshaal-palestinian-state-will-be-the-fruit-of-liberation. “Therefore, the only way before us is steadfastness and resistance in the West Bank, too. Resistance would drive Israel out of the West Bank, as it did in Gaza.” Lena Odgaard, “Head of Palestinian Islamic Jihad Praises Relationship with Iran,” Al-Monitor, November 30, 2012, http://www.al-monitor.com/pulse/originals/2012/al-monitor/shallah-interview.html. “Iran has been providing us with the support we needed to defend ourselves in the face of the Zionist occupation. Iran supported us militarily and financially and with all we need to remain steadfast on our land. We hope that all the Arab countries do the same.” Lena Odgaard, “Head of Palestinian Islamic Jihad Praises Relationship with Iran,” Al-Monitor, November 30, 2012, http://www.al-monitor.com/pulse/originals/2012/al-monitor/shallah-interview.html. “In Palestinian history, resistance was always a source of inspiration for our people to continue the struggle in order to get back our rights and homeland, Palestine.” Lena Odgaard, “Head of Palestinian Islamic Jihad Praises Relationship with Iran,” Al-Monitor, November 30, 2012, http://www.al-monitor.com/pulse/originals/2012/al-monitor/shallah-interview.html. “Gaza is the human shield between Israeli aggression and Egypt.” “Meshaal: Palestinian State Will Be the Fruit of Liberation,” Middle East Monitor, November 28, 2012, https://www.middleeastmonitor.com/news/middle-east/4736-meshaal-palestinian-state-will-be-the-fruit-of-liberation. “The United States is the best place in the world to live in. But, unfortunately, the gang in the White House sees everything through Israel's eyes, and the government manipulates the people's vision of what is going on outside the country.” Scott Atran and Robert Axelrod, “Interview with Ramadan Shallah, Secretary General, Palestinian Islamic Jihad,” Perspectives on Terrorism, November 29, 2010, http://www.terrorismanalysts.com/pt/index.php/pot/article/view/95. “But I will never, under any conditions, accept the existence of the state of Israel.” Scott Atran and Robert Axelrod, “Interview with Ramadan Shallah, Secretary General, Palestinian Islamic Jihad,” Perspectives on Terrorism, November 29, 2010, http://www.terrorismanalysts.com/pt/index.php/pot/article/view/95. “There is no possibility today of a two-state solution. That idea is dead.” Scott Atran and Robert Axelrod, “Interview with Ramadan Shallah, Secretary General, Palestinian Islamic Jihad,” Perspectives on Terrorism, November 29, 2010, http://www.terrorismanalysts.com/pt/index.php/pot/article/view/95. “The US and Israel heighten Iranophobia to gain the support of Arab regimes, which fear Iran.” Scott Atran and Robert Axelrod, “Interview with Ramadan Shallah, Secretary General, Palestinian Islamic Jihad,” Perspectives on Terrorism, November 29, 2010, http://www.terrorismanalysts.com/pt/index.php/pot/article/view/95. “We do not trust the so-called peace process.” “‘Two-State Solution Is a Disaster,’” Al Jazeera, October 14, 2009, http://www.aljazeera.com/focus/2009/10/2009101451842607440.html. “We do not recognise Israel as a legitimate entity within this region and see it as an invading body that was cultivated in this area as a representative of Western interests and colonial powers.” “‘Two-State Solution Is a Disaster,’” Al Jazeera, October 14, 2009, http://www.aljazeera.com/focus/2009/10/2009101451842607440.html. "To those who tell us to stop the martyrdom operations we say: give us an alternative." Graham Usher, “Weakened Arafat Left in Isolation as Factions Offer Alternative Route,” Guardian, June 5, 2002, http://www.theguardian.com/world/2002/jun/06/israel. “No one has the right to object to us giving away our souls and turning them into human bombs for a cause we consider more important and more sacred than our lives.” “Profile: Palestinian Islamic Jihad,” Fox News, February 20, 2003, http://www.foxnews.com/story/2003/02/20/profile-palestinian-islamic-jihad. “If America is the one to divide the world into the ‘camp of the good’ and the ‘camp of the evil,’ and if it puts the Palestinian people and its Jihad fighters on the evil side, claiming that the martyrs are evil, then we say: ‘Allah, make us all evil, [make us all] anger America and blow up in the heart of this cursed Zionist entity….’” “Profile: Palestinian Islamic Jihad,” Fox News, February 20, 2003, http://www.foxnews.com/story/2003/02/20/profile-palestinian-islamic-jihad. “We are going to retaliate with a language that the enemy can only understand. The danger of the suicide operations are coming.” “Profile: Palestinian Islamic Jihad,” Fox News, February 20, 2003, http://www.foxnews.com/story/2003/02/20/profile-palestinian-islamic-jihad.